The Current Interview | Welcome to Sandraphillips.com - Sandraphillips.com! ….”She says she began to see a faster growing fanbase when she put her website up just after Emotions Of Life came out. ‘Once I got a website, it started growing into much larger proportions,’ she said. ‘The internet audience is very receptive to independent artists’. 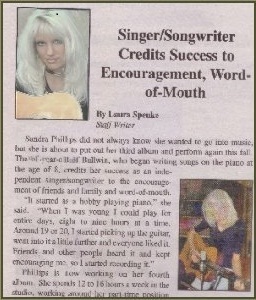 In December alone, Phillips had over 600 downloads, and enjoys being hooked up to her fans this way….."